Independence Day seems like an appropriate time to make an announcement about the future of our country. I’ve been surprised at how early my fellow candidates have started their ’08 campaigns. Today, I am leaping to the forefront. I have formed an exploratory committee and I plan to run for President of the United States in 2016, my first election of eligibility. 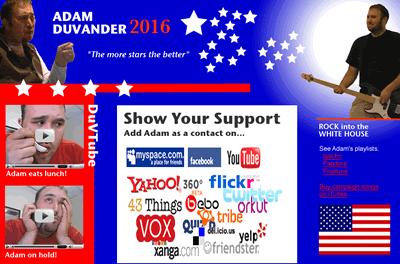 Be sure to check out my campaign site and add me as a friend/contact on every single social network that exists. If you’re into patriotism, be sure to see why Bowlers Unite for America. Turn your head and rock, dude. you DID work hard on the 4th, i KNEW it.